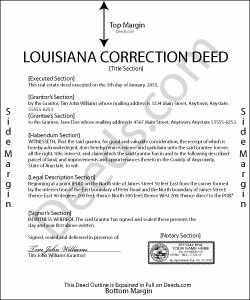 Use the correction deed to correct an error in a previously recorded quitclaim, warranty or grant deed in Louisiana. In Louisiana, a previously recorded deed can be corrected by recording a second deed for the sole purpose of correcting the error and preventing potential title flaws, which may create problems when the current owner attempts to sell the property. The correction deed does not convey title but confirms the prior conveyance. For the most part it reiterates the prior deed verbatim, except for the correction. Louisiana statutes also allow for an affidavit or act of correction, which must be executed by the notary or preparer of the original act or deed, or by a notary familiar with the records and the reason for the necessary correction. Such an act of correction is effective retroactively "to the date of recordation of the original act," but does not "prejudice the rights acquired by any third person before the act of correction is recorded" (LARS 35.2.1). It is usually reserved for clerical errors, such as minor omissions or typographical mistakes, sometimes called scrivener's errors. When in doubt about the gravity of the error and its effects, it may be safer to record a correction deed since that involves execution by the affected parties and acknowledgment by a notary in the presence of two witnesses. The correction deed must be executed from the original grantor to the original grantee and state that its purpose is to correct a specific error, identified by type. It references the prior deed by date(s) and by book and page number, as well as place of recording. Certain types of changes, however, might not be achieved by the use of a correction deed. Adding or omitting a grantee, for example, or changing the manner in which title is held, or making material changes to the legal description, especially deleting a portion of the originally transferred property, may all require a new deed of conveyance instead of a correction of the original deed. Any S. said: I was looking for realty transfer or deed in the name of ***** **** and could never find the list of realty transfers. Reply from Staff: Thank you for the feedback Any. We do not offer searches by name, only by property. Robert W. said: The forms were as I expected them to be. The guide was very helpful. Overall very good. Reply from Staff: Thanks Robert. We appreciate your feedback. Select Parish where the property is located.